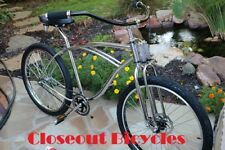 Monarch 26" Dual Spring Disc Option Fork 1" Threaded Bicycle Cruiser Fork. bike Headset 21.1x32.5x27mm Black. Bicycle Headset Part. Bike Bicycle 70mm Brake Shoes W/Nut Black/Yellow. Incredible Double Springer Bicycle Fork! Does Not Include Bicycle or Brake. The fork is a New Similar copy of the Old Monark Springer Forks. The Quality is good, and actually better than the Original Monark Fork. There is a Tire to Rim variable in tire sizes when actually mounted on rim, but from our experience your good with a 26" x 2.5" tire and a larger can be a tad tricky. Genuine Lowrider Fork! 1" Threaded Double Springer Fork! 1" Threaded. Dual 26" Fork. Steerer 1". Fork is Painted Black Steel to be use with 1" threaded headsets and 26" wheels or smaller. 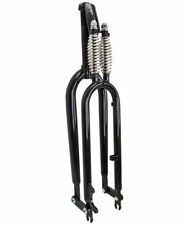 The fork is a New Similar copy of the Old Monark Springer Forks. The Quality is good, and actually better than the Original Monark Fork. For those models get our UN CUT version and cut it down to the proper size for your application. There is a Tire to Rim variable in tire sizes when actually mounted on rim, but from our experience your good with a 26" x 2.5" tire and a larger can be a tad tricky. Sunlite Deluxe Springer Replica Fork 26 180x70x25.4x27 Disc Bk F/175mmstack Ht. 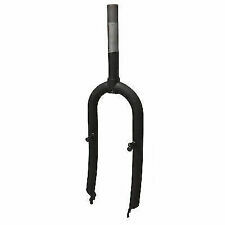 Sunlite Recumbent Fork 20 Rcmbt Crmo 250x155x22.2x27.0 V/disc Bk. 8352 Black. 1" Threaded. Dual 26" Fork. As Always the best deals are right here! Steerer 1" . This fork is special setup for disc break! Fork Tube Length: 7 “long, threaded 2” from the top. Fork Leg Length: 15” long from the bottom bearing race to the drop outs where the front wheel axle is. WANDA 26 x. 75 Bicycle TIRE Beach Cruiser Schwinn Style BIKE ALL BLACK G-5001. 1 EACH - BICYCLE TIRE 26" X 2.125 BLACK/WHITE BEACH CRUISER CHOPPER BIKE TIRE. 1 EACH - BICYCLE TIRE 26" X 2.125 ALL BLACK BEACH CRUISER CHOPPER BIKE TIRE. Manufacture Sunlite. Item Model Springer Replica. Second Category springer. Third Category threaded. Threaded 1` (7/8 ID). Suspension 26`. Manufacture Part Number. Main Category Forks. For use on your beach cruiser. custom cruiser. or where a fork like this is needed. FORK HAS DISC BRAKE TABS. Threaded Steerer tube. Classic Old School Look. Suspension Provides a Smooth Comfortable Ride. Does NOT Include Headset cap, Race or Bearings. Make sure this item will fit your application. For use on your beach cruiser. custom cruiser. or where a fork like this is needed. BLACK monarch style dual Springer fork. THIS FORK ALLOWS YOU TO ADD DISC BRAKES. Fork 20 Rcmbt Crmo 250X155X25.4X30.0 V/Disc Bk. V-brake and disc mount. Steerer: 1 " ,length 9 3/4", 6 " threaded. Item: 153670. Sunlite Bicycle Springer Fork 26"
Hi-Tensile steel construction. Thread Length: 70mm. Steerer Length: 180mm. 4.5 out of 5 stars - Sunlite Bicycle Springer Fork 26"
4 product ratings4 product ratings - Sunlite Bicycle Springer Fork 26"
Dual 26" Fork 1" Threaded 8352 Black. Steerer: 1 " ,length 9 3/4", 6 " threaded. Color: Black. We will do whatever is reasonable to resolve any problem you may have. In the event that you have a problem. Steerer: 1 " ,length 9 3/4", 6 " threaded. Item: 153661. Dual 26" Fork 1" Threaded 8353 Black. Steerer: 1 " ,length 9 3/4", 6 " threaded. Color: Black. We will do whatever is reasonable to resolve any problem you may have. In the event that you have a problem. 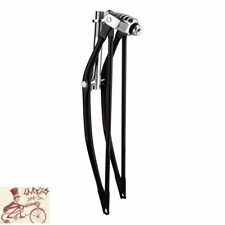 Need a front brake - Cruiser Front Brake For Straight Springer Fork part# 870020. Need a disc brake - Springer Fork Disc Brake Bracket part# 505216. Need a disc brake kit - Springer Fork Disc Brake Kit part# 840542.